The veteran BBC Radio 2 broadcaster died on Tuesday evening (04.04.17) just a few months after stepping down from his job due to ill health. Brian's family released a statement confirming the sad news, which read: "Our beloved Brian Matthew passed away last night. We ask that our privacy is respected at this time." 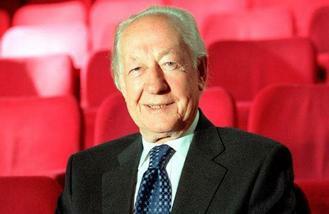 Tony Hall, BBC Director-General, has paid tribute to Brian's contribution to the corporation which he he joined in 1954, describing him as a "true broadcasting great". He said: "Brian Matthew was an outstanding broadcaster who entertained and engaged millions over generations. He had a wonderful style of delivery and a real connection with his listeners. Bob Shennan, Director of BBC Radio and Music and former BBC Radio 2 Controller, also praised the late DJ, saying: "Brian was a radio legend. For decades, his voice was the sound of Saturday mornings, giving pleasure to listeners on 'Sounds of the 60s' with his wit and warmth. He will be sorely missed." Brian was one of the UK's most popular and beloved presenters and he delighted listeners on Saturday mornings for 27 years when he played the nation's favourite songs on 'Sounds of the 60s' and shared his memories of the decade which gave us The Beatles, The Rolling Stones and Bob Dylan. He was one of the first DJs on Radio 2, and hosted shows such as 'Saturday Club', 'Thank Your Lucky Stars' and 'Late Night Extra', but he is probably best known for presenting the long-running 'Round Midnight' programme which won the 1987 Pulitzer Publishing Award. In 1990 he received a Broadcasting Press Guild Award for Outstanding Contribution to Radio. Brian stepped down from hosting 'Sounds of the 60s' due to ill health earlier this year. Brian had presented the show since April 1990, and presented his last full show on November 19. On Saturday 25 February, Brian presented his final show, a compilation of his favourite moments from his time at Radio 2. In a change to schedules, a special tribute programme looking back over Brian's illustrious broadcasting career, will be aired on Friday 7 April from 7-8pm presented by former Radio 2 controller Jim Moir.